RONDOUT VALLEY � This past May, the partnership of the Open Space Institute and the Wallkill Valley Land Trust made an important announcement: the groups have purchased 11.5 additional miles of what had been the Wallkill Valley rail bed, including the famous Rosendale Trestle, a move that will eventually allow for a continuous rail trail that will stretch from Gardiner to Kingston. The purchase presents a significant potential for local economic growth, and could help spark progress within the Rondout Valley. Some months ago, an inter-municipal agreement was reached between the Towns of Rochester, Rosendale, Wawarsing, Marbletown, and the Village of Ellenville. Its stated goal was to work in concert towards the realization of a rail trail that will span the length of the Rondout Valley, from Kingston to Ellenville. A collective organization, known as the Rail Trail Initiative, includes all of these municipalities in conjunction with the Rondout Valley Business Association, which is acting as a facilitator for the various efforts of the multi-tiered project. One might imagine that such a diverse effort would be the type of enterprise that could take quite some time to take shape. Not so, says RVBA President Richard Travers. "We are doing what we can to help everybody push this thing along," says Travers, "And I assure you, it is happening, and it's happening now." Mr. Travers, the RVBA's President since 2008, makes clear that, with the proper planning and innovation, things are falling into place. "It's all viable, it's all doable, and it won't cause any trouble for anyone," he says. This coming Saturday, September 18, will be an example of exactly that: progress actually being made. 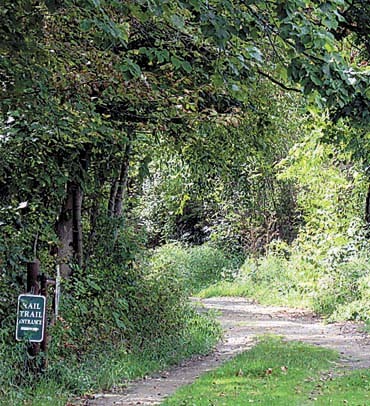 The RVBA will be out in support of the D&H Canal Heritage Corridor Alliance, and the Town of Rochester Rail Trail committee, widening and clearing the approximately one-and-a-half miles of trail between Kyserike Road and Lucas Turnpike in Rochester. Leading by example, Travers himself will be donating his time, and his equipment, to the project. And that, says Travers, is only the beginning. Travers cites the efforts of Carl Pezzino, head of the Marbletown Rail Trail Commission, who is leading active and visible work throughout the town of Marbletown. "They are doing a stellar job," comments Travers, "linking rail trail, improving trailheads, signage, and maintenance. Just a wonderful job." Yet, even if the project does take shape, can it really hope to provide the kind of economic stimulus so desperately needed in the region? Travers' answer is unequivocal. "For years, we have been searching for an answer: how do we foster economic growth in the Rondout Valley? This is it. A continuous rail trail is the single most important thing we can do to help this economy." Specifically, plans are coming together which will lead the trail right down Main Street in Accord, if and when an agreement can be reached with the Open Space Institute, which owns the historic Appeldoorn Farm which spans from Airport Road to Whitfield Road along Route 209 � an ideal route to help connect the trail from Lucas Turnpike down to Accord's business district. Looking further south, the planned complete rail trail will make another significant stop: downtown Kerhonkson. A newly formed local advocacy group, Friends of Historic Kerhonkson, is supporting these efforts, which, in combination with the anticipated completion of the Kerhonkson Bridge, will help to revitalize the hamlet. According to Travers, he has no intention of stopping there. Plans include continuing the trail down to the Village of Ellenville. One of the key elements will be working with the New York State Department of Corrections, to allow the trail to pass through the edge of Naponach's Eastern Correctional Facility ground, where, in fact, the original towpath of the D&H Canal makes for a perfect thoroughfare. Mr. Travers credits continuing efforts by organizations like the Open Space Institute (www.osiny.org), and the D&H Canal Heritage Corridor Alliance (www.dandhcorridor.org), as well as the continued work of each of the towns involved, and is confident that the visible success will continue to grow. On the horizon, the Rail Trail Alliance is planning a series of local "town hall" meetings to introduce, inform, and involve residents in the process of this valuable work. "The more people know, the more their going to want to be involved, the more it will happen," says Travers. For more information, visit the RVBA at www.rondoutvalley.org.